A number of years back, when I first started writing this blog, I think I used the title, “It’s Here!” So I’ll just say “again,” this time and not try to be particularly creative. The last two blogs talked about “that” time of the year, and “teased” this one. Well, it is time and it is here. Yesterday afternoon, taking a different route than usual home from work, I looked across one of mid-Michigan’s ubiquitous farm fields, just in time to see some stray sun rays break through the cloud cover and light the treetops of the wooded section in the back of the field. And in those light rays, there were reds and oranges and yellows in several of the trees; the harbinger of things to come. The season is early yet here in Saginaw County, but with an unusually cold, wet summer, it will not surprise me if we have an early color season. We have yet to have a true frost, but we have certainly flirted with it a couple times already this month. The days are definitely getting shorter, and the air, cooler and crisper (albeit moister than normal, also). The farmers have begun to harvest their crops. And it is, after all, already the second half of September. In years past, I have had the fortune of traveling to some place (away from home, of course) where geographic features create a setting for more spectacular fall color than can be found in our flat, farm fields that go on for miles here. This Fall, I may make a couple trips to Northern lower Michigan. This is not the Upper Peninsula that I have written so glowingly of, but it is an area I have not explored (nor exploited) as much as I would like. I have made scouting trips in the off season and noted probable good photographic setups. But I have not found the way to get there during prime color. This year may be early and I may pull it off. During normal “prime time” I will – as I have noted – be in San Francisco, where the color is local, and of a bit different variety. Still, I have hopes of bringing something back from there, too. Here’s hoping that those of you who are privileged to travel, find what you are seeking. I wish the best to my friends in Vermont, my friends in Ohio, a special friend from Pennsylvania who I suspect will find his way to West Virginia, and another in Minnesota, who hopefully will make it to the North Shore of Lake Superior in time to catch some color. Best to all for a successful and fun Fall Foliage shoot! 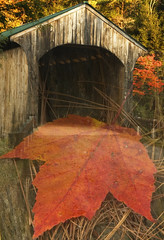 This is the final of my personal picks, 22 “best of” Fall Foliage images. Perhaps it is fitting that I saved what may be the very best for last — and ironic that it is the oldest of the bunch, shot on film. Andy, I’ve always struggled with capturing fall color but you have done some very nice autumn work. I particularly like the falls at the top of your last week’s rant, but you have so many good ones. I’m afraid I won’t get to the North Shore this year. Lynne can’t bear weight on her broken ankle until after she sees the doctor on October 7. My camera has been collecting dust since we got back from Alaska. I’ve learned more about doing the laundry and dishes, preparing meals and cleaning house than I ever wanted to know. Hopefully she will have an uneventful recovery and we’ll be able to catch the color along the Mississippi River. Al: When you are ready to make the long drive over the top, I can take you to those Falls. Rich and I have made 2 trips there. After four straight years and nine total autumns of doing Vermont, my wife wanted a year off. But we (or I) will return there in 2015, Lord willing. I think I know more about Vermont than my native Texas.